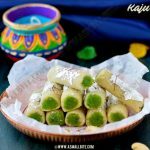 As Raksha Bandhan or Rakhi is celebrated tomorrow August 8, I am sharing a special sweet Dodha Burfi recipe made with only 3 ingredients that’s really a ease isn’t it? Usually cocoa powder / cracked wheat / wheat flour is added to get the dark brown colour, but no need to run in search of long list of ingredients. I didn’t use any of these, the dark brown colour will be missing, but it tastes the same. Last year when I tried, I missed the jaggery syrup consistency and it turned super chewy. But this time, I was alert! and this mawa burfi recipe turned out perfectly. As all of you know this festival celebrates the love and duty between brothers and sisters, I am dedicating this sweet to my brother. 1. Add powdered jaggery and water in a bowl. Crumble mawa and keep by side. 2. Chop almonds, pista and keep everything ready. Grease a tray with ghee on all sides. 3. Pour the immersed jaggery in a pan, heat till the jaggery melts completely. 4. Now bubbles appear and continue to boil in medium flame. The jaggery syrup starts to thicken. Keep water in a small bowl ready to check the consistency. Pour 2 drops of jaggery syrup in the water, if dissolves the syrup is thin. If it stands firmly in the water, then try to roll into a soft ball (not hard ball), then it’s right. Don’t boil further else the burfi turns hard and keep by side. 5. Heat ghee in a non stick pan and add the crumbled khoya. 6. Cook in low flame for 10 minutes with continuous stirring to avoid burning. Slowly the colour of the khova changes into brown colour as it gets roasted. 7. Now filter the jaggery syrup to remove impurities and pour over the khova. Keep stirring till the mawa leaves the sides of the pan and ghee separates. Switch off flame. 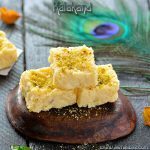 The burfi mixture should be in the slight flowing consistency, so it will be easy to spread and it thickens with time also. 8. Pour the burfi mixture in the tray and level it with a ladle / spatula. 9. Sprinkle chop nuts all over. When it is warm enough just make a mark with a knife. Allow it to cool for 3 hours, so it turns firm. Then remove the burfi. 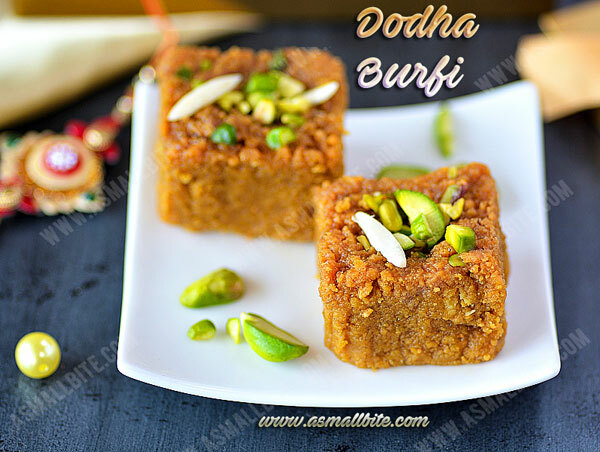 Celebrate raksha bandhan with this dodha burfi. 1. 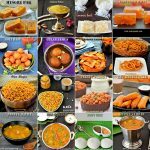 Use good quality mawa for nice taste and colour. 2. Use a non stick pan or heavy bottomed pan to avoid burning of mawa. 3. Slow roasting the mawa in low flame is very important to get the color and grainy texture. 4. Always be cautious when roasting khova, else it gets burnt and taste bitter. 5. Jaggery can be replaced with sugar as done in traditional way. 6. Jaggery syrup should be in one string consistency or you should be able to make a soft ball. 7. 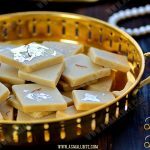 Don’t boil the jaggery syrup more than one string consistency, else this dodha burfi recipe turns hard. 8. 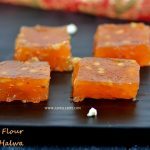 Always filter the jaggery to remove impurities for this mawa burfi recipe. 9. Usually cocoa powder / cracked wheat / wheat flour is added to get dark brown colour, but I didn’t use. 10. Switch off flame, when it is in the flowing consistency itself, as it will be easy to spread and it thickens with time. 11. 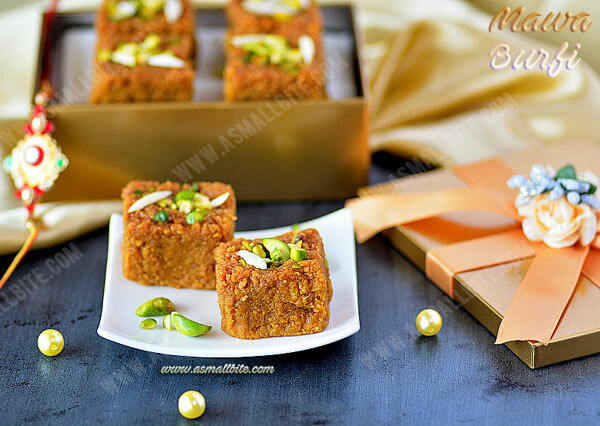 Also don’t heat the burfi after it reaches flowing consistency, otherwise it becomes chewy. 12. 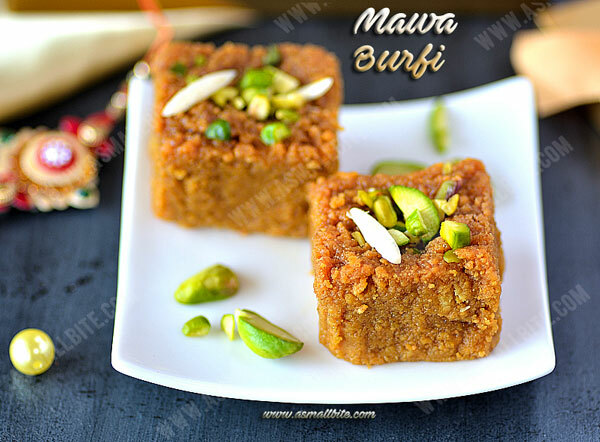 Always cool for minimum 3 hours, so the burfi becomes firm.